« Collecting Fabric… how much is too much and how to store it? 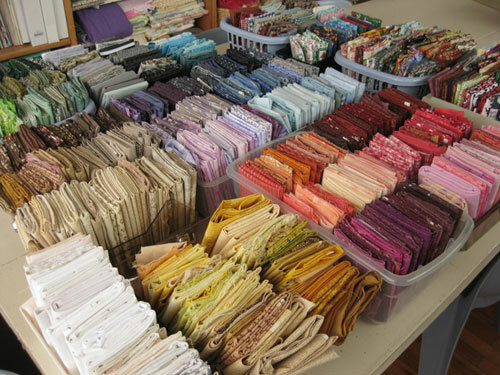 So far, my FQ stash was limited to four shelves. And that’s the way I plan to keep it. 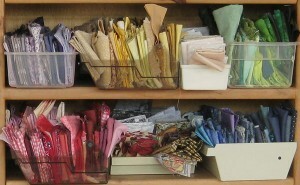 But some reorganizing was necessary because the fabrics were jammed in so tightly in their containers and starting to spill out. A word here about some of my containers. 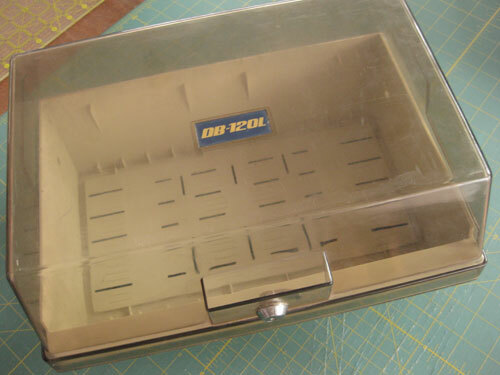 By any chance, do you remember these boxes? Yep, they used to store those 5¼ floppy drives. We’re talking like 20 years ago! 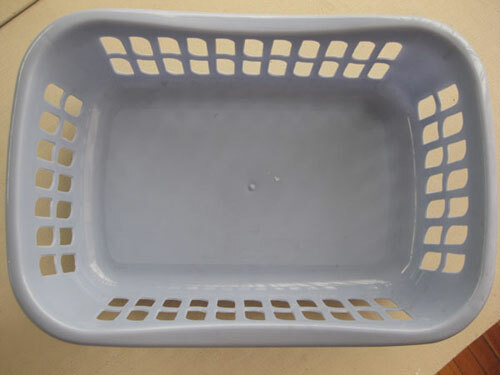 I had several of these and over the years they have floated around the house. I never quite new how to repurpose them. 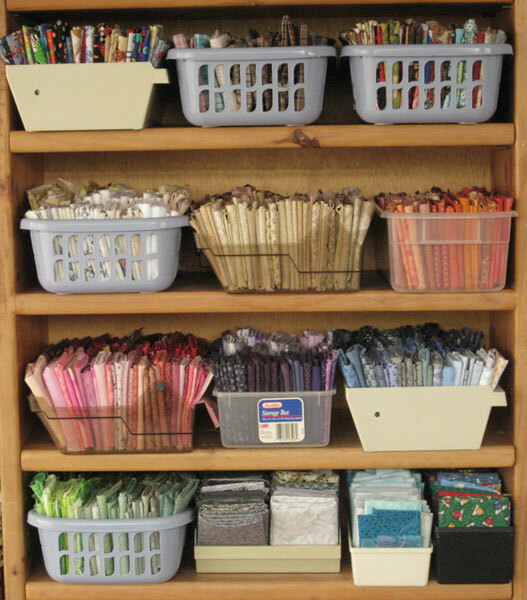 Well, it turns out they are perfect for storing FQs! 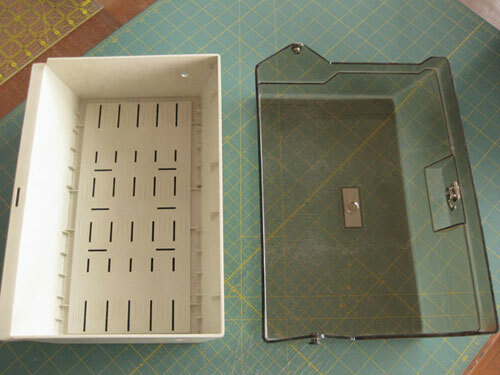 The lid comes off the hinges easily… and I ended up with four big and two medium “boxes” in which to store FQs. 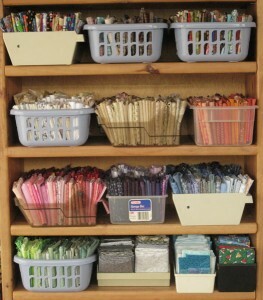 I also had a couple of tupperware boxes, but realized I needed a few more to better store this fabric collection. So I found these little plastic baskets, about the same size as the boxes above. What’s great about this solution is that I can store (perfectly) three rows of FQs in each box, and each box contains one color family. And pulling the boxes off the shelves and putting them back becomes really easy. I just had to take a few minutes to enjoy the view of my whole FQ collection spread out! Now, isn’t that nice eye candy? 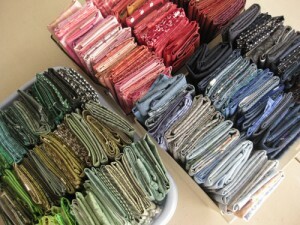 And once stored, my FQs still take up the same four shelves. But don’t they look so much neater? Yay!